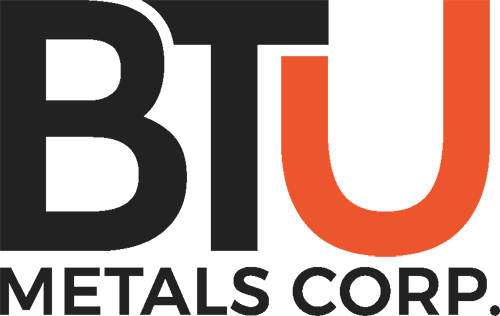 February 20, 2019, Vancouver, BC, Canada – BTU METALS CORP. (“BTU” or the “Company”) (BTU-TSX:V) announces preliminary findings of an ongoing, in-depth assessment of geophysical data covering BTU’s Dixie Halo project, in addition to the surrounding region by well known geophysicist Mr. Alan King of Sudbury, Ontario. Initial findings of note include the existence of multiple zones of major D2 fold disruption (see Fig 1). 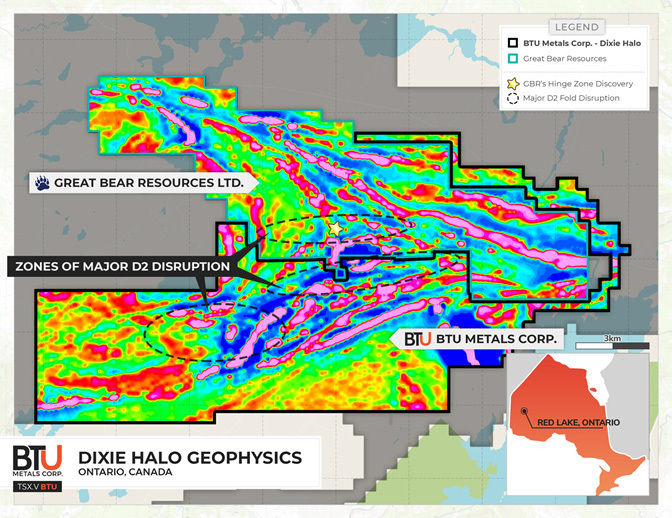 The D2 fold within the Dixie Halo boundaries is of particular interest to BTU as these have been successful indicators for neighboring Great Bear Resources Ltd. (GBR-TSX:V) at its Dixie Project. Additionally, the Red Lake-Campbell complex (Red Lake gold mine) also occurs proximal to a regional D2 fold where shear zones developed and acted as primary hydrothermal fluid conduits. Mr. King’s experience includes posts as manager of geophysics at Inco with responsibility for global exploration as well as chief geophysicist for Vale Global Exploration working on geophysical applications and target generation using regional and global data sets. Since 2012 he as been working as a consultant specializing in integrating earth science data in gold and other commodities. “After reviewing the property and regional geophysical data it is apparent, mainly from recent (2016) OGS magnetic data, that there are two major East- West disruptions in what has been interpreted (Great Bear Resources 2018) as a large D2 (Deformation event 2) fold that extends across the Great Bear property and south onto the BTU claim block. This is considered significant as the northern structure hosts the new Great Bear high grade gold discovery and the second similar structure, about 2000 meters to the south, is located mainly on the BTU claims. This environment has some similarities to the Red Lake mines area where the two major parallel Dickenson and Campbell shears disrupt an F2 fold (Folding event 2) structure and host high grade gold mineralization (Dube 2001 Preliminary report on the geology and controlling parameters of the Goldcorp Inc. High Grade zone, Red Lake mine). This structure on the BTU claims is considered a priority target for followup. Several other structures at various scales are apparent on the interpreted large D2 fold on the BTU property and these may be of interest for exploration as well.” stated Mr. King. A full report on Mr. King’s findings will be posted on the BTU website once complete. Figure 1: Colour mag 1VD data of BTU Metal’s property surrounding that of Great Bear Resources is shown in black outline with location of Great Bear Resources Hinge Zone Discovery shown. To view reports and maps of the Dixie Halo Project please visit https://www.btumetals.com/?project=3. The drill hole intersection reported on the property location map is not on the Company’s Dixie Halo Property. Mineralization that may be hosted on adjacent properties is not representative of mineralization that is, or may be, hosted on the Company’s Dixie Halo Property. The technical contents of this release were approved by BTU’s VP Exploration Mr. Doug Hunter, P. Geo., a qualified person as defined by National Instrument 43-101.